"The Princess" is planning on wearing this "ribbon swirl bun" for her 4th of July hairstyle this year. 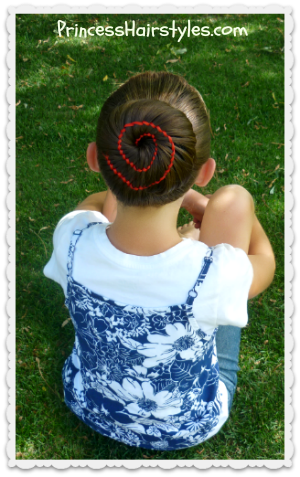 Although this is a great holiday hairstyle, it really can be worn for many different occasions. Of course, you can use any color of ribbon, yarn, etc. to accent your bun and change up the look. For example; elegant sliver or white ribbon would make more of a sophisticated or glamorous updo which would be pretty for a wedding, prom, or other formal occasion. Brightly colored ribbon is going to stand out and "pop" more for a festive and fun look. 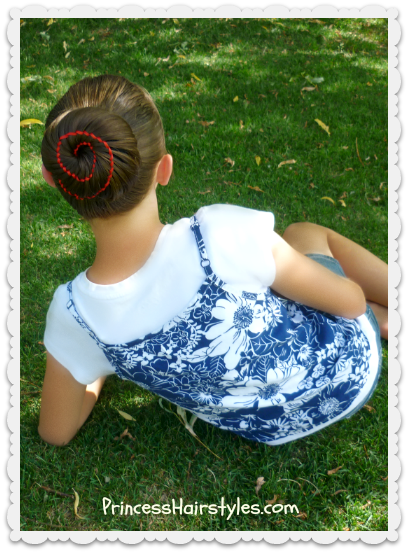 I think this hairstyle would also be adorable for Christmas time (using red or green ribbon.) The swirling design reminds me of a lollipop! If you want to add more than one color, you can definitely do that as well. Or if you prefer not to use ribbon at all, 2 strands of hair could be used to accent the bun instead. 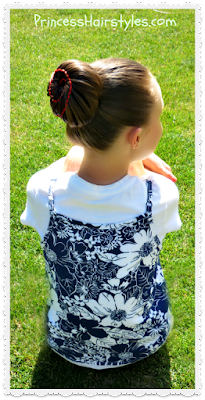 If you are a dancer or gymnast, this style would be great for dance recitals and competitions! As mentioned in our video (below) there are several different methods you could use to finish this bun. We chose to keep things simple for our tutorial. But, if you are wanting something more intricate, you could braid, twist, roll and pin, or even make a starburst (or never ending) braid with the remaining ends! We love the waterfall ribbon twist braid (which was used to create the swirl design in this bun) and have used it in several other hairstyles on our blog. The "waterfall ribbon twist rainbow ponytail" and the "Aztec carousel braid" are a couple of examples of how this braid can be utilized in a hairstyle. Bun maker. 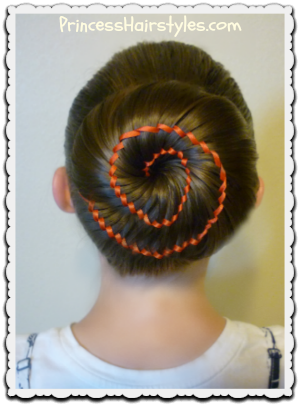 The bun maker or "hair donut" shown in our tutorial can be found in most beauty supply stores and discount stores. I have actually even seen them at the dollar store from time to time. If you do not have one, you can cut the toes out of a sock and roll it up to achieve a similar tool. Ribbon. The ribbon we used was 1/4 inch thick and about 4 feet long. This hairstyle should work with long hair, medium length hair, straight hair, wavy hair, and possibly curly hair.